two shapes in a $2n\times 2n$ grid sheet, can we pick third one? Can anyone help me with this problem? It just popped to my mind!!! 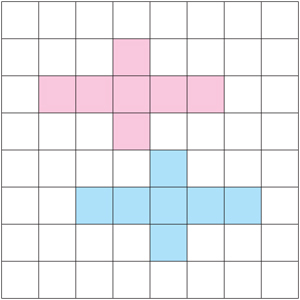 we have a $2n\times 2n$ grid sheet and a connected shape $L$ consisting of $2n-1$ grid squares. we've cut two copies of $L$ out of the sheet. Is it always possible to cut a third copy of $L$? I think the answer is yes, but I couldn't solve it. any Ideas? Let $n=4$. Label the squares $(a,b)$, $1\le a\le8$, $1\le b\le8$. Cut out the identical shapes $$(3,3),(4,3),(5,3),(6,3),(7,3),(5,2),(5,4)$$ and $$(2,6),(3,6),(4,6),(5,6),(6,6),(4,5),(4,7)$$ You'll find you can't cut out another copy of this shape. Proof: any copy of this shape must have a row of five, horizontally or vertically. The row of five can't be along an edge of the square because there must be a square on either side of the row of five. No horizontal row, other than an edge, has five contiguous squares, once you have cut out the two shapes. The only columns with five contiguous squares, other than the edge columns, are columns 2 and 7, and those two locations for the 3rd shape are blocked by the missing squares at $(3,3)$ and $(6,6)$, respectively. Number of triangles possible in android lock patterns? How many different ways can a group of students be hired to work a survey?